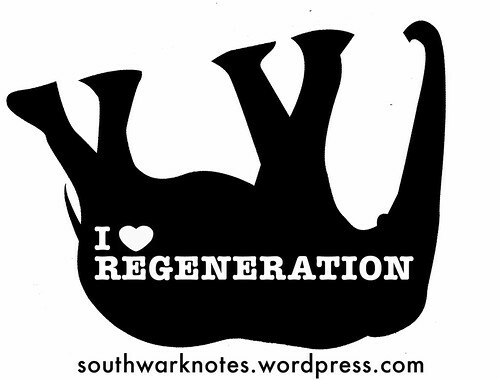 ART & EMPTY SOUTHWARK INDUSTRIAL BUILDINGS 1980’s – NOW | Southwark Notes - whose regeneration? 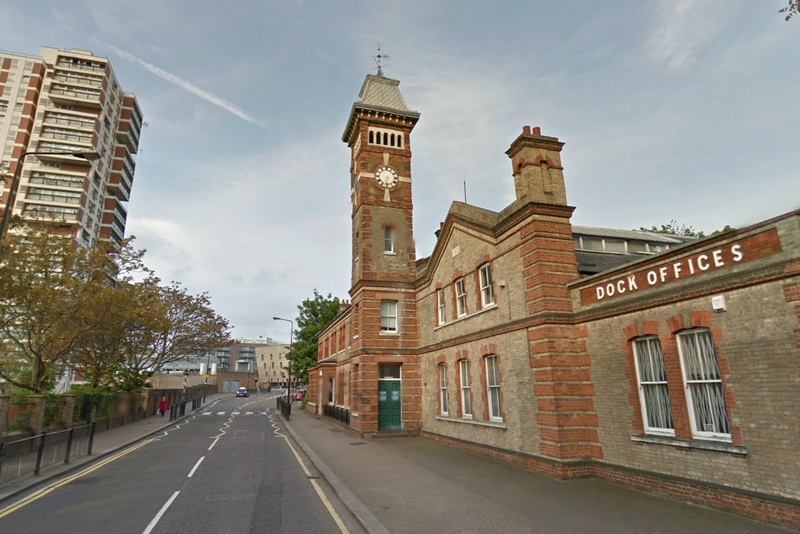 For earlier artists in Butlers Wharf 1971 – 1979 see here! 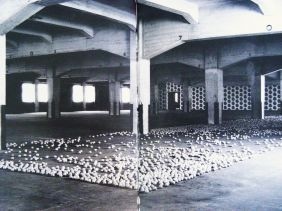 • Freeze was the title of an art exhibition that took place in July 1988 in the empty London Port Authority-owned Surrey Docks Offices on Surrey Docks Rd mainly organised by Damien Hirst. 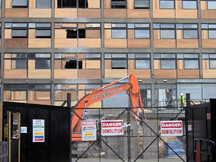 As the legend now has it, it was the birth place of the ‘Yba’ or Young British Artist. Some of the artists pulled together for this initial show included Angus Fairhurst, Angela Bulloch, Mat Collishaw, Damien Hirst, Sarah Lucas, Richard and Simon Patterson, Gary Hume and Michael Landy. “Freeze had an impact, it seems, because not only were the included artists still students but also because of the very way in which the exhibition itself was packaged. There was aura of professionalism generated by the show’s large scale and glossy catalogue, itself including an essay by a respected writer, Ian Jeffrey. Resultantly, it was striking because it was the antithesis of the usual student show…Another element to be factored into this construction was the presence of Goldsmith’s tutor Michael Craig-Martin, who encouraged and fostered not only the use of a conceptual visual language, but also the importance of selling the artist. 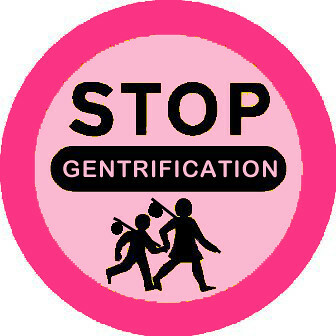 Another point to be considered in relation to the emergence of the ‘Yba’ was the economic climate that surrounded them, with their work first shown on the cusp of the boom and bust of the late 1980’s. 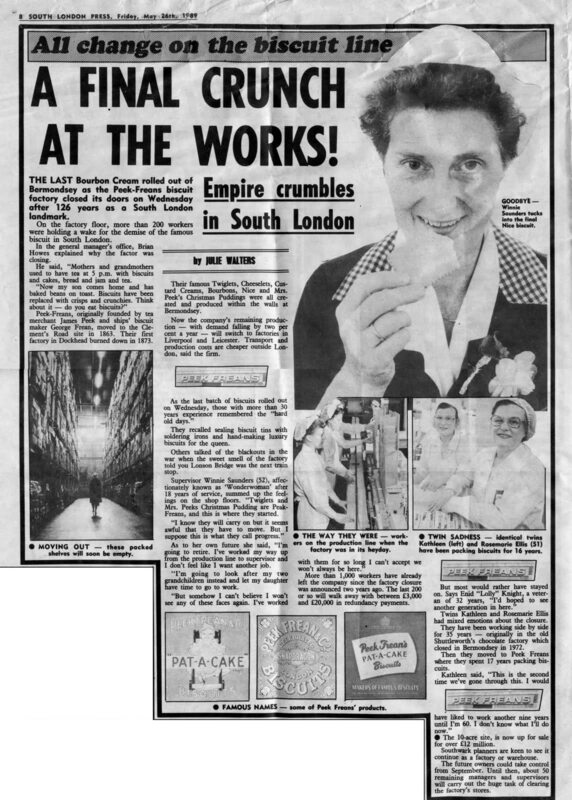 The result was not only a glut of empty retail spaces in which to display their work, but also a new generation of collectors who made their money in the halcyon days of the late Thatcher years”. 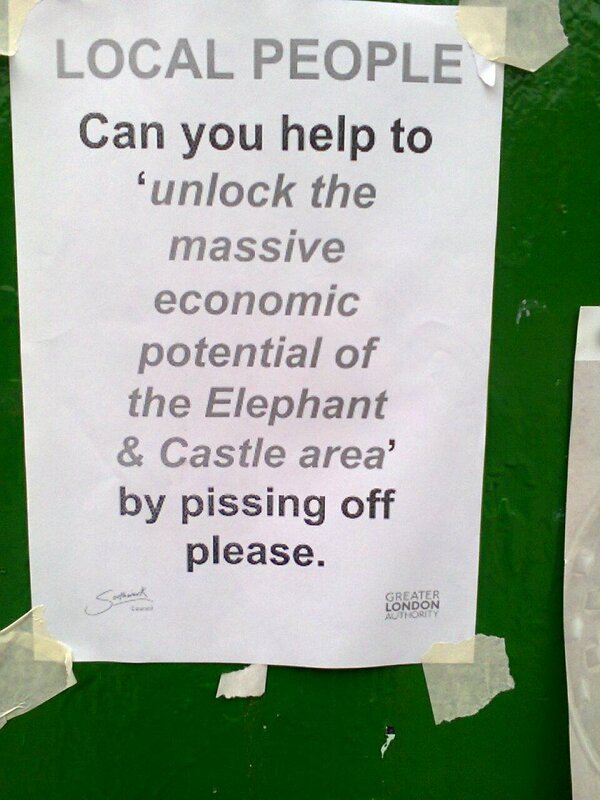 From Damien Hirst website here. 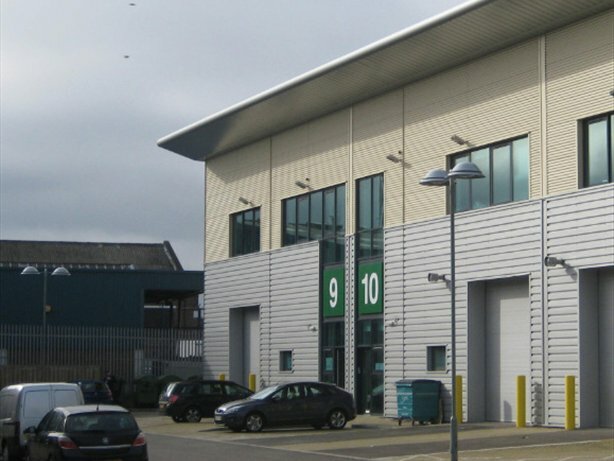 • His input, though supportive at the Freeze show and as an old friend of Hirsts, gelled in 1990 with the warehouse shows Modern Medicine and Gambler, held at the ex-Peak Freans factory in Clements Rd, Bermondsey. Charles Saatchi sponsored the former to the tune of £1,000 and subsequently bought Hirst’s ‘A Thousand Years‘. 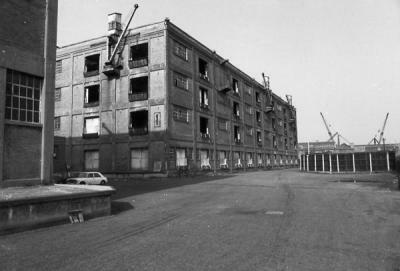 Freedman, with Billee Sellman, in fact, curated two influential “warehouse” shows in 1990, Modern Medicine and Gambler, in the factory they designated Building One. To stage Modern Medicine they succeeded in raising £1,000 sponsorships from artworld figures including Charles Saatchi. Freedman later spoke about the self-fulfilling prophecy these sponsors helped to create in terms of the success and hype of the YBA years. The exhibition included the work of eight artists, all students or recent graduates, being Mat Collishaw, Grainne Cullen, Dominic Denis, Angus Fairhurst, Damien Hirst, Abigail Lane, Miriam Lloyd and Craig Wood. 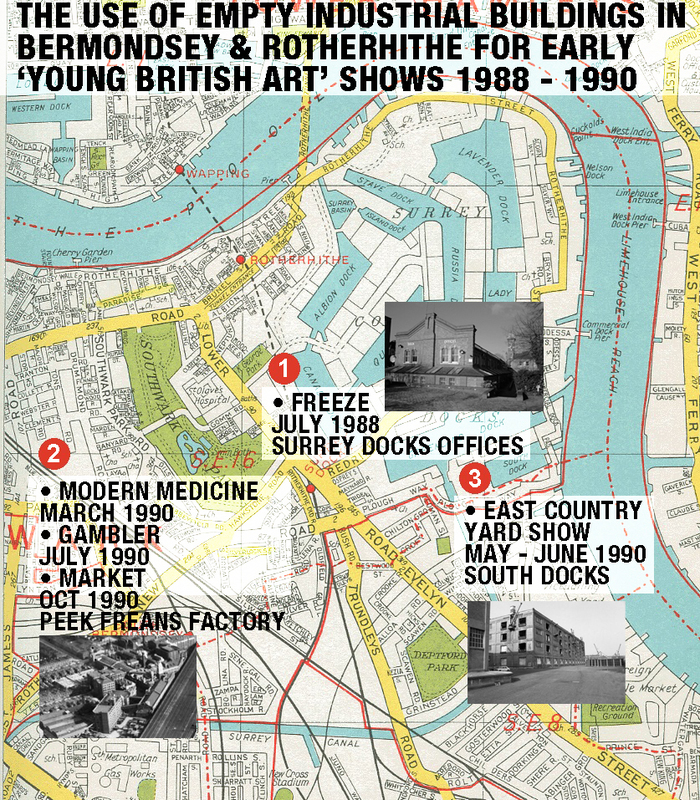 ‘Modern Medicine’ was made possible by donations gathered by the curators from a collection of 19 galleries and institutions, including the London Docklands Development Corporation, The Prince’s Trust and Southbank Centre. 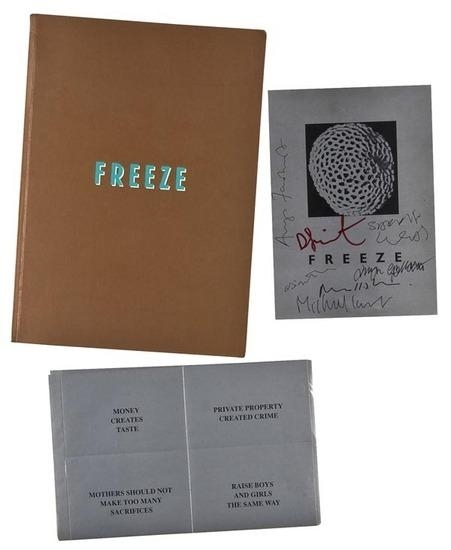 As with ‘Freeze’, a highly finished exhibition catalogue, designed by Tony Arefin, was produced on the occasion of the exhibition, including an essay by Angus Fairhurst. 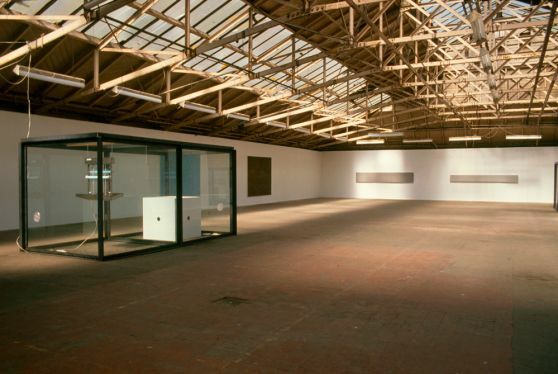 Following the success of ‘Modern Medicine’, Billee Sellman and Carl Freedman organised a second show in the same disused factory. Hirst withdrew his curatorial involvement, but exhibited for the first time his seminal fly work ‘A Thousand Years’ (1990) consisting of a large glass case containing maggots and flies feeding off a rotting cow’s head. Saatchi arrived at Gambler in a green Bentley was immediately impressed by (and then bought) Hirst’s first major “animal” installation. On the occasion of the exhibition, an edition of 500 colour catalogues was produced, which included interviews between each artist and Liam Gillick. The artists featured in ‘Gambler’ were Dan Bonsall, Dominic Denis, Steve di Benedetto, Angus Fairhurst, Tim Head, Damien Hirst and Michael Scott. 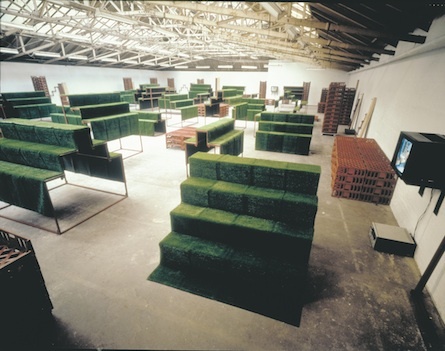 “Michael Landy’s Market was an installation made by arranging typical market-stall stands, artificial grass and plastic bread-crates in a vast disused industrial space in south London. 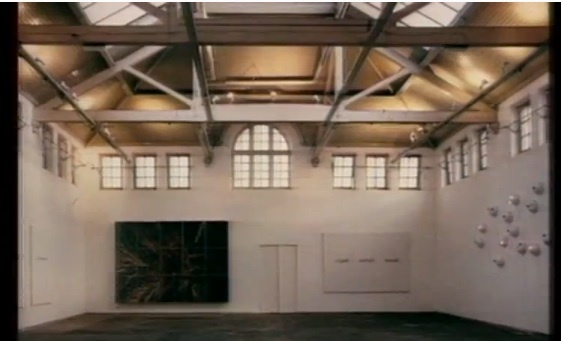 The still above are taken from a video piece called ‘Appropriations’, which was shown on three monitors around the space. 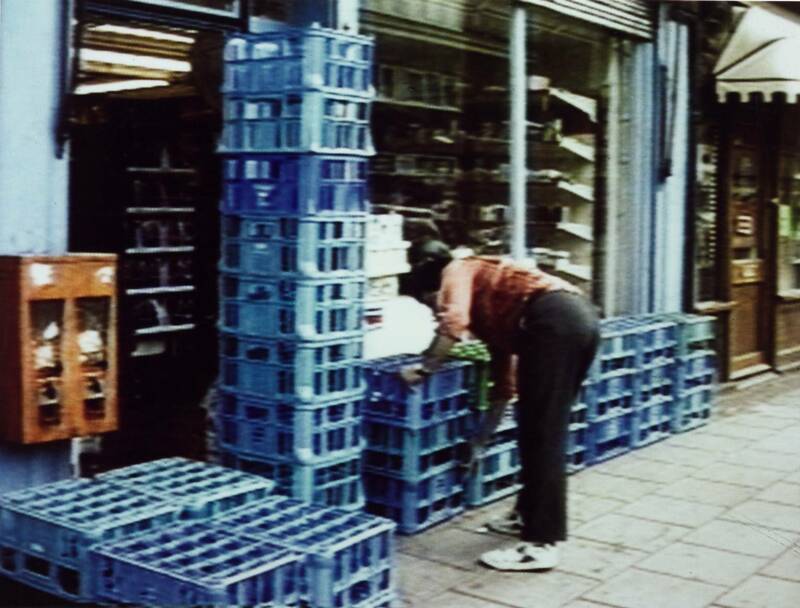 The video shows high street grocers setting up their stalls for the day, using the ubiquitous plastic crates ‘borrowed’ from bread manufacturers as platforms for their goods. Landy draws attention to this act of theft and re-use that has become part of an accepted daily ritual repeated throughout the world“. 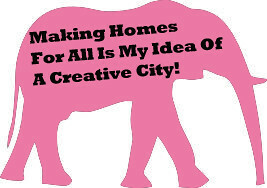 Landy’s Market was the first solo show and the last Building One show as apparently the free rent period was running out. The picture above is not of the original Market piece but its inevitable recreation for a show in Paris ten years later. “Sources close to Hirst say that he is now a US$ billionaire, making him worth more than twice what The Sunday Times Rich List estimates (£215m in 2010). Damien Hirst presides over a network of studios and assistants which produce a vast amount of work. This is mostly sold in private, and therefore confidential, transactions. The true scale of the operation is unknown (to journalists). Hirst is believed to have produced around 200 butterfly paintings in 2007 alone—these can sell for several million dollars (a 2001 canvas made $2.3m at Phillips De Pury in New York last November). Hirst is also thought to produce multiple editions of all his greatest hits including his animals in formaldehyde. He is said to have sold a sculpture of seven sharks in formaldehyde, The Seven Deadly Sins, in Paris for $35m”. 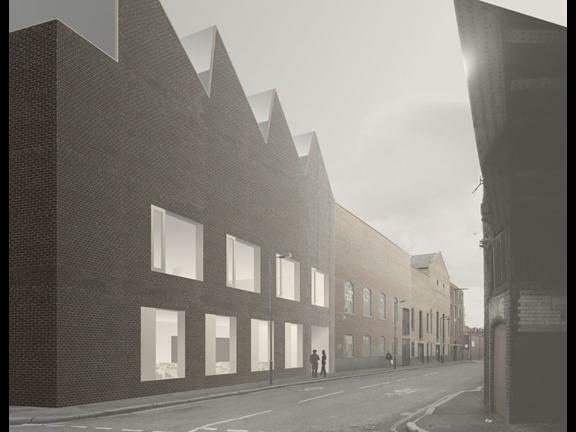 Hirst is now currently turning the Newport St complex into ‘his Saatchi gallery‘ of his own art collection plus the inevitable restaurant and so on. 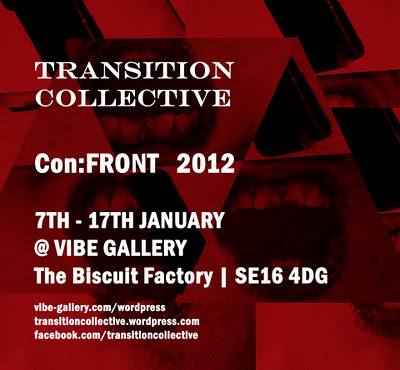 Vibe Gallery is located at the heart of Bermondsey, among other businesses inside the old Peak Freans Biscuit Factory within the Tower Bridge Business Complex. 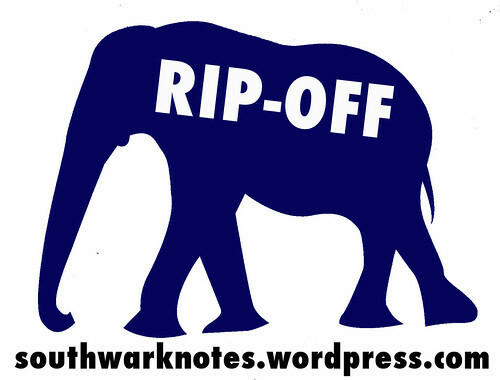 It also is home to the Southwark Arts Forum. 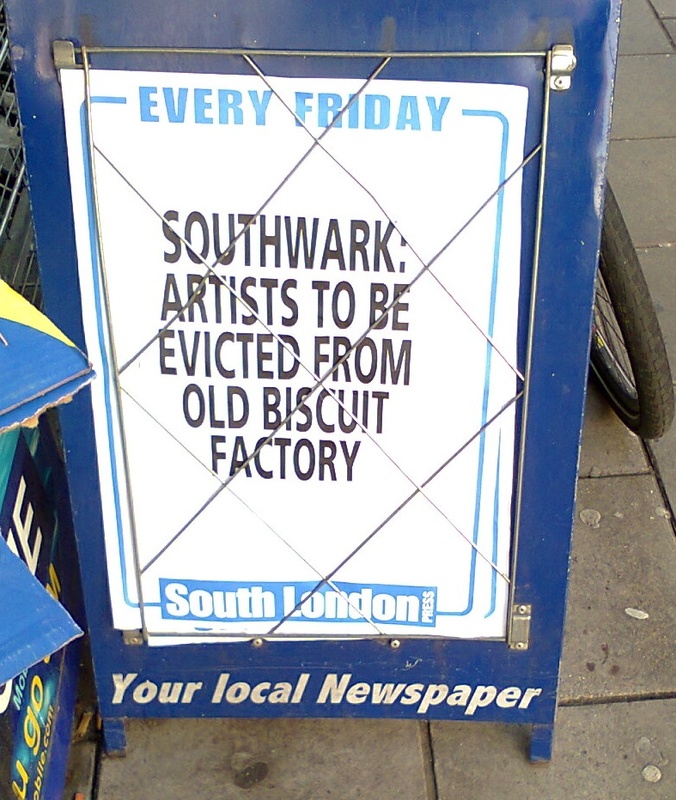 UPDATE: FEB 2014 – “The development comes after it emerged that a former biscuit factory in Bermondsey, which hosts close to 400 artists, had been sold and will be converted into 800 flats.” Thus runs once more the ever long saga of artists occupying sites and buildings only until the big money is ready to capitalise, chuck them out and build for profit.